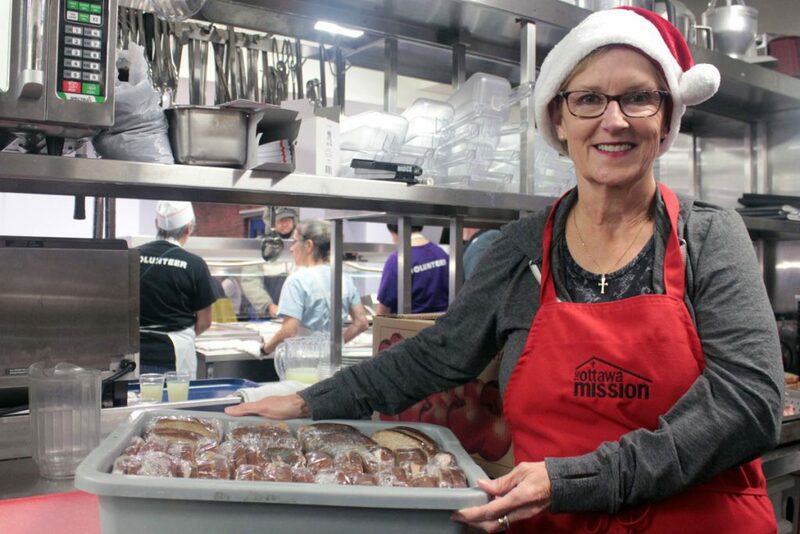 With more than 20 years of service under her “apron” Kit McKay is one of The Ottawa Mission’s most longstanding volunteers at our annual holiday dinners. She has generously helped us out at all three dinners – Easter, Thanksgiving and Christmas – every year, almost without exception. She began volunteering for us by bringing her two teenage sons with her – as a way of showing them that there were people in their own community who were hungry and needed help. Kit felt an immediate connection with The Mission and the people we serve, and she hasn’t looked back. Kit will be front and centre at our Christmas dinner on December 16, and given her vast experience, she will be wearing a “red apron” as a volunteer team leader. To Kit and the hundreds of people who volunteer at our special dinners and all year round – thank you for your service, and for the smiles you bring to the faces of people who often have little to smile about.